1/27/19 Members of the Laflin Fire Dept. completed the third day of a 16hr. Basic Rigging for Rope Rescue, hosted by the Nanticoke City Fire Dept. Members were instructed on rope hardware, patient packaging, and hauling systems which can be used in various aspects of rescue. We would like to thank the following instructors, Matt MacDonald, Mike VanLouvender, and Carl Menne. 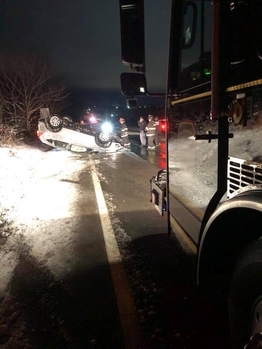 12/16/18 The Laflin Rescue and Chief handled a 1 vehicle rollover on SB I 81 MM 173.2 in Laflin at 3am. Both occupants self extricated. Units handled traffic control , scene lighting, and assisted tow operator and were released by PSP after 1 hour. The Laflin Fire Department was recently notified that it's ISO rating has improved to a 4! Established in 1971, the Insurance Services Office (ISO) is the primary source of fire-related insurance risk to municipalities. ISO evaluators visit and evaluate municipal fire service organizations approximately once every five (5) to ten (10) years. ISO performs a comprehensive analysis of the complete fire protection system for the municipality, including the dispatch center, water supply infrastructure, and all aspects of fire service organization and operations. When we received our last score in 2013 LVFD improved from a 7 to a 5. This year LVFD was rated a 4! This puts Laflin Fire in one of the top tiers in the country along with many local fire departments with full time staffs. In addition Laflins score was 70 % on it's way to a 3! We are proud of the hard work of our members in training, equipment upgrades and all aspects that the ISO looks at to rate the department. Many upgrades have been taking place over the course of the last year, specifically to our rescue capabilities after handling nearly 200 motor vehicle accidents since 2016. Most notably, the company upgraded our “Jaws of Life” Hydraulic tools from our Amkus Rescue System purchased used in the early 2000’s, to a full compliment of Holmatro Hydraulic Tools. This includes a cutter, spreader, and ram. These tools, although still purchased used to save our much needed funding, are still newer, lighter, and are more advanced than our previous hydraulic equipment. 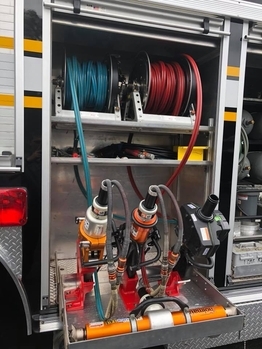 In the last month, Rescue Chief Rienard and some of our other dedicated volunteers worked to make these tools easy to deploy with limited manpower. They are now powered to two electric reels powered by an electric generator with a slide out tray pictured below. The work of our volunteers is what continues to allow us to provide the exceptional service we provide to the Borough of Laflin. Just after 8pm, the Engine, Rescue Squad and Chief were sent to 7 Main Street in Laflin for a reported structure fire with a resident heard coughing inside and not exiting. All 3 Laflin apparatus were on the scene within 3 minutes of initial dispatch and encountered smoke showing and a working fire in the kitchen. Engine 1 stretched a line, the resident was located semi-responsive inside the kitchen door. She was removed with the assistance of PSP. The Engine crew then made their way to the kitchen and made quick work of the fire. The fire was extinguished within 20 minutes and held to the kitchen area. Along with the resident, a family dog and cat were pulled from the home alive. Thanks to all responding departments on the third home saved on the Main Street stretch of Laflin this year. Often you only read about fire departments who have financial difficulties or have multiple issues when the Pa Auditor General visits to audit relief Association funds every 2-3 years. The Laflin Fire Department received the below audit report on June 25th 2018. As with every audit done by the state on our records, the Pa Auditor found all records for the Laflin Fire Department in perfect order with no issues found. We pride ourselves on running your fire department in the responsible manner our residents have come to expect. 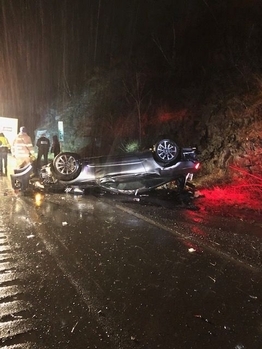 Crews had little rest after Tornado response as the Rescue Squad and Car took in this MVA with reported Confinement on Interstate 81 in Laflin. Rescue crews found no entrapment on scene but 2 injuries. This came after a 7am box requesting the Engine to Centerpoint Blvd in Jenkins for a possible structure fire. It was found that a dumpster near the building was smoldering, and there was no fire at the facility. 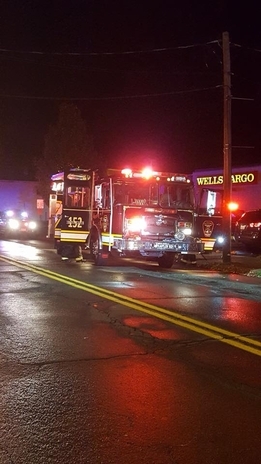 The Engine, Rescue and Car were requested by Luzerne County 911 to respond into Wilkes Barre Township to assist with Special Service duties after the township’s main marketplace area was hit by a large tornado. 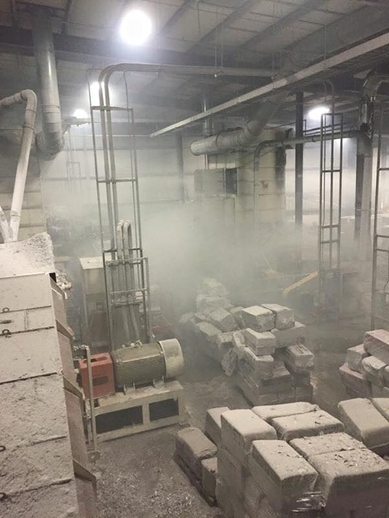 It was reported that occupants were trapped in multiple businesses with severe structural collapse, cars and trucks thrown hundreds of feet, and multiple gas leaks and power lines down in the area. Chief Malvizzi and Rescue Chief Reinard assisted with running the Technical Rescue Command post utilizing Car 152 while the remaining 5 Laflin members geared up and assisted with primary searches of area buildings to locate any trapped occupants. Multiple stores in and around the Arena Hub Plaza were destoryed or heavily damaged. Destroyed business' include, Panera Bread, Tovan , Sneaker King, Game Stop, Holiday Hair, Famous Shoes , UHaul, Kurlanchick Furniture and Dicks Sproting Goods. Heavily damaged were Barnes and Noble, Ashley Furniture, Pollock Nissan, Tj Max, and Pets Smart .Laflin units operated for approx 4 hours before returning. Engine assists Plains Fire on the "I"
Just after 4am, box 5201 was sent to 24 Main Street in Laflin for the reported dwelling fire. Engine 152 signed on with additional information from Luzerne County 911 of gunshots fired and other conflicting information. 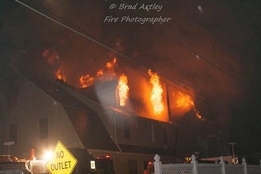 The Engine arrived first with heavy fire conditions from the first floor in the rear. 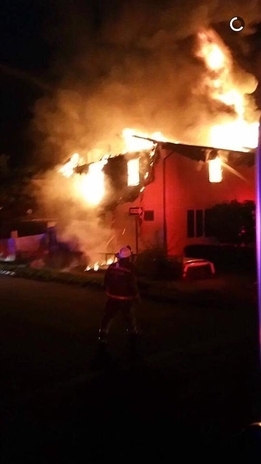 The Engine stretched the primary attack line to the rear and grabbed a water supply making entry knocking the bulk of the fire within minutes of the initial dispatch. As additional companies arrived, 3 additional lines were put into service to the second floor and exterior exposures. Chief 143 (Jamie Merlino) handled accountability & IC while Chief 152 (Marc Malvizzi) handled operations command. While the Engine was attempting to gain entry, a resident confronted Fire/EMS being combative with a knife in hand. He had to be subdued with the assistance of fire/EMS personnel and was taken into custody by the Pennsylvania State Police. 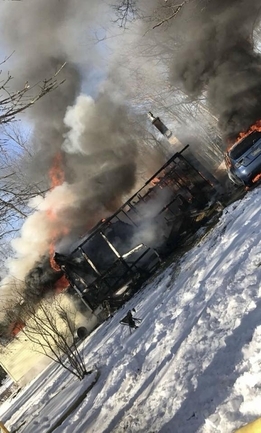 The cause of the fire was determined to be arson by a State Police Fire Marshal and a suspect was arrested on arson and other charges. Thank you to our mutual aid companies for their assistance! The Laflin Fire Departments EONE Cyclone Heavy Rescue has been placed in full service. Unit features a Amkus Cutter, Spreader and Ram set with 100' hydraulic reel, junkyard dogs, rescue jacks, Holmatro Combi Tool, 12000lb winch, Air Bags, 7 MSA Air Packs, 6 Cylinder 4500 PSI Cascade , 20 KW PTO generator , cribbing, 2 100' electric reels, stokes, reeves, backboards, rope rescue equipment, scene cleanup equipment including pigs pads and haz mat cleanup equipment, 7 500w quartz floods with 2 tripods, and LED brow lighting, Unit will be Laflin's primary response unit for vehicle accidents and used for lighting/air/equipment support at all structure fires and misc calls. Unit was purchased from the Wildwood Crest NJ Fire Dept with just 11000 miles. 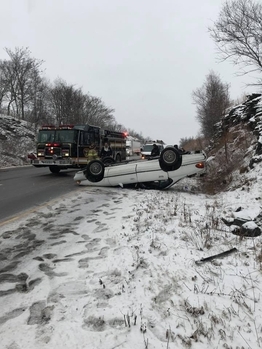 The Engine and Car handled a overturned auto with reported entrapment on I81 in Laflin. The patient was self extricated upon arrival. 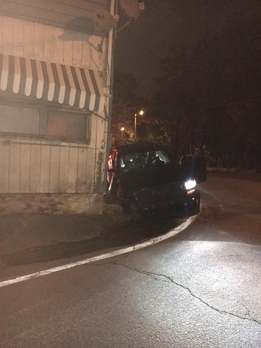 While enroute the 152CAR found a car into the bridge wall at 84 lumber, 152 split crews and the CAR stayed at that call until Jenkins PD arrived. There were no injuries. 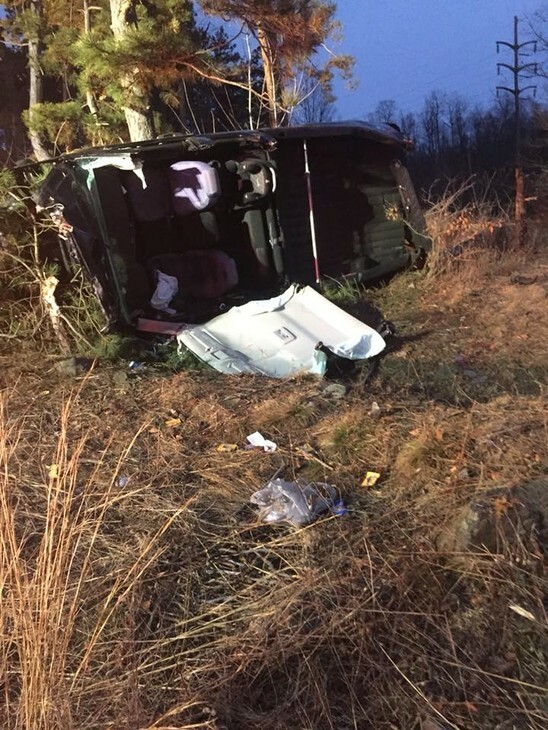 At 0601hrs, box 5281 was sent to Interstate 81 North at MM172.8 in Laflin for a reported vehicle accident, possibly a vehicle rolled over and down an embankment. Engine’s 152 (Laflin) and 148 (Jenkins) arrived simultaneously and Laflin Chief 152 found a pickup truck on its side that had gone off the road, up a 20ft embankment before going airborne and traveling a total of 210 feet before striking a tree. The operator of the vehicle was heavily entrapped which prompted command to add an additional heavy rescue from Pittston Twp. 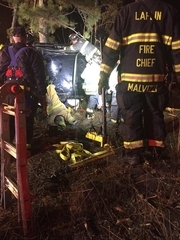 Companies from Laflin, Jenkins Twp and Pittston Twp worked for a total of 38 minutes to complete the extrication of the heavily entrapped occupant who was then transferred to the care of Medic 2. Units cleared after approx 90 minutes. Thank you to Pittston Twsp and Jenkins Township Rescue Companies for the assist. Rescue 1 made its Laflin Borough debut this afternoon on Rt.315 in Laflin. 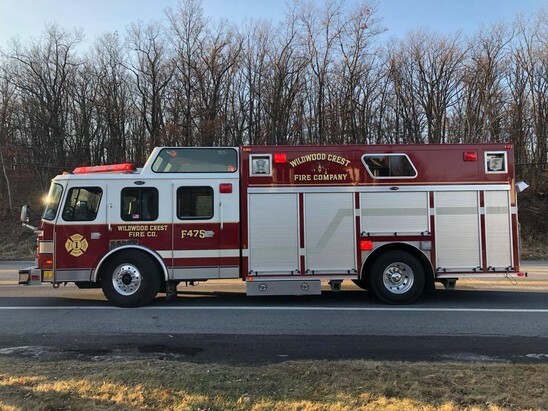 While Chief.Malvizzi and Rescue Chief Reinard were bringing our new heavy rescue home, a report of a 4 vehicle accident came in on Rt.315 in the borough. Engine 1 responded and was soon joined by Rescue 1 as it entered town. In the coming weeks, R1 will be receiving plenty of TLC including tool mounting, and a fresh paint job to bring her up to speed with our other apparatus. This note from the GPRA : We received a call tonight that no emergency service agency ever wants to hear - a crash involving our own. 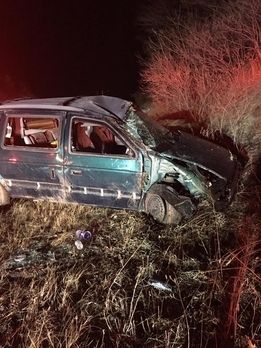 Earlier this evening, Medic 29-B was involved in a serious crash on Route 315 in Laflin. We are happy to report that our members are doing reasonably well under the circumstances. With that said, to say the crew’s efforts were heroic is an understatement. 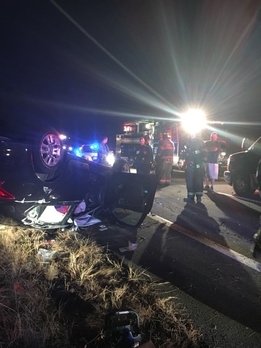 Without any regard for their own injuries, our GPRA crew tended to the patient that was being transported and the occupants of the other vehicle. Moreover, there was a massive response of off duty GPRA personnel both to the scene and the hospital. When we say we are a family, its not lip service. 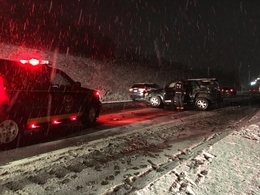 We give our unending thanks to the many emergency service agencies who came to our aid (most without waiting to be called) including Laflin Fire Department, Hughestown Fire and EMS, Jenkins Twp Fire, Pittston Twp. EMS, Plains Medic 2, Trans Med Medic 10 and CHEMS Medic 38, and the multiple police agencies. 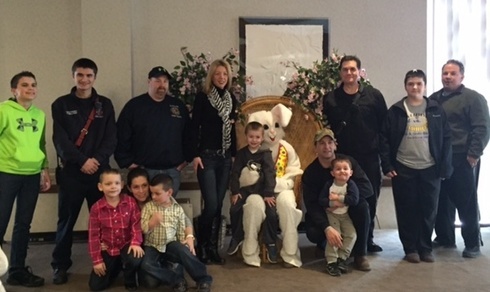 Last but not least, our Pittston City Fire and Police brethren, who left a funeral detail to come to our crew’s aid. Much love, thanks, and respect to all. Finally, we offer our thoughts to the other involved parties. 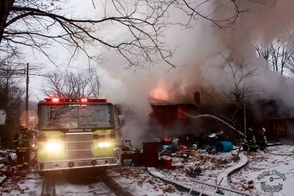 The Engine responded to a well involved structure fire on Velma Ln in Bear Creek Twp this morning. The Engine crew assisted with defensive fire attack operations fire before returning. 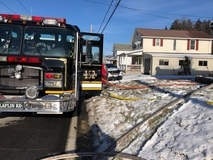 Just before 1400hrs, the first alarm assignment was struck to Main Street in Laflin for the reported structure fire, potentially caused by the homeowner attempting to thaw pipes. Engine 152 arrived on the scene within 4 minutes of dispatch to find smoke showing from the rear. Eng.152 laid a line from the hydrant while the Engine Lieutenant completed a 360. Lt.Boos found fire in the rear outside with potential extension into the residence and stretched an exterior line. 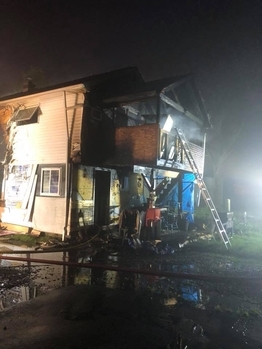 As additional resources were arriving, Laflin and Hughestown Engine Companies stretched a second and third line to the interior where heavy fire was found in the kitchen and bathroom area. Responding units had the fire out within 20 minutes of arrival containing it to just the rear of the home. All companies cleared after approx 4 hours. 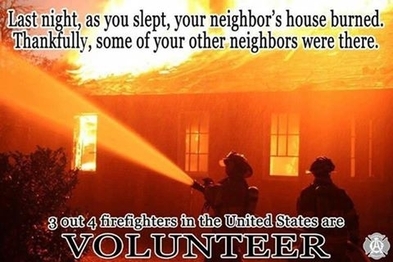 Great work to all of our mutual aid companies ! 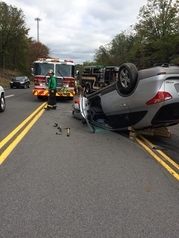 Incident #7 for the volunteers today brought the Engine and Car back to Interstate 81 for a vehicle rollover. 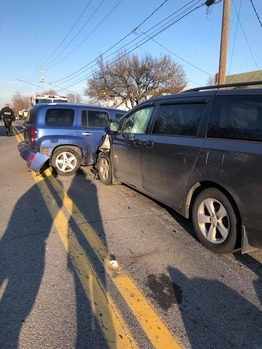 The crash was found in Plains Township and had no injuries. 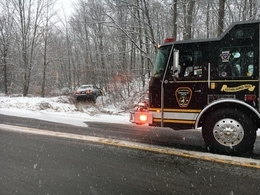 The Engine and Car assisting Jenkins Twp with additional crashes on Pittston Ave/Old Mill Road during Saturday’s snowfall. 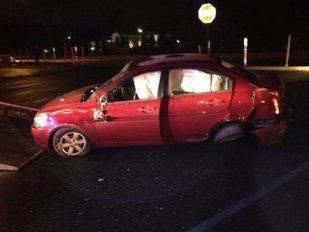 5 crashes happened within minutes on ice covered Pittston Ave. Original call came in as a crash at the Oblates. 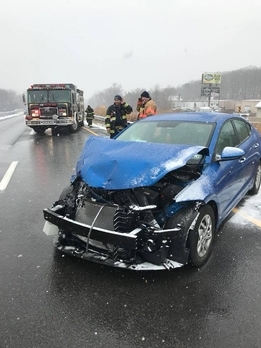 The Engine and Chief handled 3 separate MVA’s and a unresponsive patient in a vehicle all within an hour’s span on Interstate 81 during the morning’s snow squall. 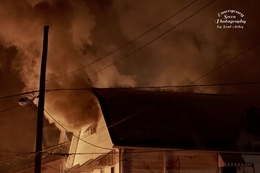 Just after 1900hrs, the first alarm was dropped to Oakwood Drive in Laflin Borough for the working fire. The Fire Command unit with the Chief and Engine 152 arrived in 2.5 minutes from dispatch reporting working fire , fire showing in the rear patio area and began stretching a line. 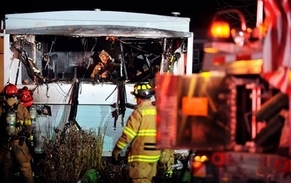 The Chief notified companies of possible entrapment. The Engine crew split its duties designating 1 crew to an exterior line in the rear while a 2 man crew entered the building for a search. Within minutes, the first victim was removed by the search team from 152 Laflin. 148 Jenkins Twsp Engine had arrived and laid in and setup a water supply to Laflin Engine 152 who had 2 lines in operation. Second victim was removed 3 minutes later then 3rd approx 4 minutes later by search crews from 143 Hughestown. Ladder 167 from Plains went to work laddering side A and ventilating front of structure. 148 crews laddered and ventilated side c in rear. The fire was extinguished within 25 minutes. Excellent job by the responding paramedics from Medic 29 and Medic 2 that worked tirelessly on scene and enroute to the hospital on the victims pulled from the building. Paramedics were able to revive 2 brothers after being pulled from the building transporting them to Geisinger Wyoming Valley where the 12 year old brother passed in the emergency room , his brother was flown to a burn center in Philadelphia where he passed away several days later. 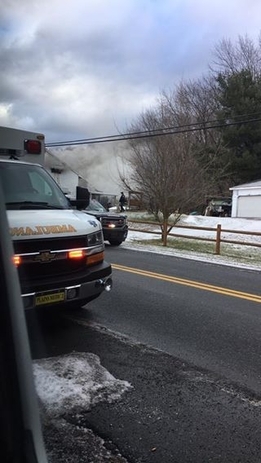 Pa State Police have ruled the fire as intentionally set and a suspect is in custody with homicide and arson charges filed. A huge thank you to all companies that responded to assist. 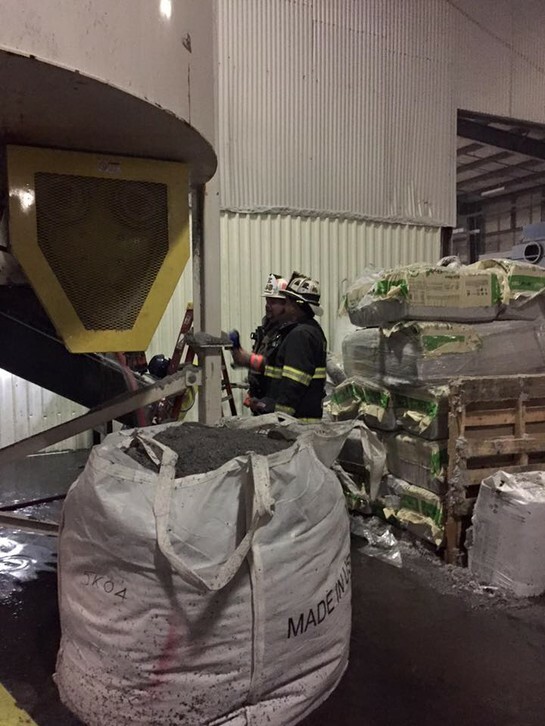 Just before 11pm , the first alarm companies were struck to US Green Fiber in Laflin for the commercial building fire. Chief.Malvizzi was first arriving establishing the command reporting smoke showing and a working fire inside. 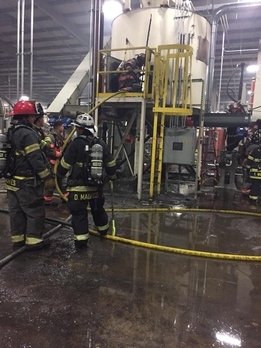 Engine 152 arrived and went to work stretching the setback line with high rise packs to begin knocking fire inside machinery and duct work inside. 148 engine supplied 152 e1 with water and it's crews assisted in fire control. Engine 143 grabbed an additional water supply in the rear and also stretched a line to assist the Laflin crews while Chief 143 handled operations command. Plains Truck handled the ventilation duties. Crews operated for approx 2 hours before returning. 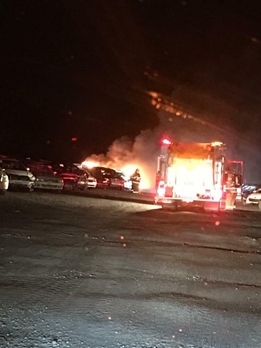 Shortly after midnight, the Engine and Car were requested as part of the initial alarm to Wyoming Ave in Exeter for a reported structure fire with possible entrapment. The Engine arrived as soon as the first attack line was entering the building and the crew was initially tasked with completing a primary search of the second floor apartments. After the search was complete, the crew went to work assisting with fire attack and overhaul. AC.Malvizzi was tasked with Operations Command inside the fire floor. Crews cleared after approx 3 hours. While the Engine was assisting Jenkins Twp with a vehicle vs.pole outside 84 Lumber on Rt.315, the volunteers were alerted to a vehicle rollover with entrapment approx 1 mile from their location in Jenkins to Laflin Boro. 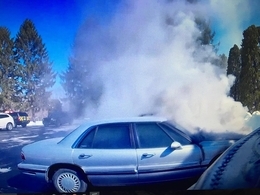 Car 152 was first arriving reporting a vehicle on its roof with the operator confined inside the vehicle. Engine 1 arrived on scene and quickly stabilized the car and assisted EMS with the extrication. Patient was in the hands of EMS within 5 minutes. Station 143 assisted. Engine’s 152 and 148 were sent to a single vehicle rollover with reported entrapment on Rt.315 in Laflin. E152 was first arriving finding a single vehicle on its roof with the occupant still inside. 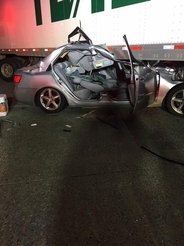 The patient was extricated within 10 minutes via removing both passenger side doors and transported to Geisinger Medical Center with minor injuries. 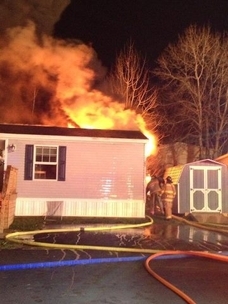 Car 1 responded as a special assignment request to assist Wyoming Boro with a confirmed dwelling fire. Car 1 arrived quickly behind first arriving units and assumed the accountability duties while the additional crew went to work with the west side companies. Units operated for approx 3 hours before returning. 8/21/17 - Tonight the members and officers from the Lake Ariel Fire Dept picked up Laflins 1992 Pierce Engine. Good luck to Lake Ariel Fire with your new vehicle and stay safe. Just before 2am, Engine 152 responded as part of the 1st alarm assignment to Acton Technologies in Jenkins for the reported building fire. Eng.148(Jenkins) arrived to find an unknown fire in the salvage yard across the street. Engine 152 laid 1000' of LDH from the hydrant to supply Eng.148 who had lines in operation. 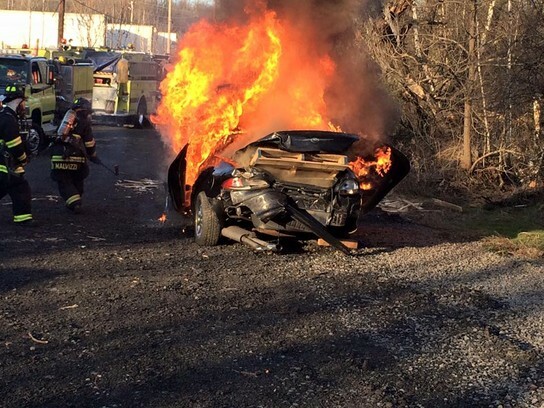 152 crews assisted Jenkins and Pittston City units extinguish a total of 11 vehicles that were well involved. Companies operated for approx 2 hours before returning. For the third straight year Laflin Fire was invited to Troop P Camp Cadet to do a vehicle rescue demonstration. Thanks to PSP Troop P for having us back year after year. Early this morning, we learned the unfortunate and unexpected news of the passing of Laflin Borough Paid Engineer/Paramedic Scott Zimmerman. 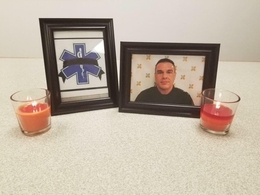 Scott served as a Paid Firefighter/EMT in Laflin in the early 2000's before continuing his career as a Firefighter/Medic in Virginia before returning to the area and once again becoming a member of our force earlier this year. Scott was also a full time Paramedic with Commonwealth Health EMS. Scott, thank you for your service to not only the Borough of Laflin, but all other communities you have served. RIP brother, we've got it from here. 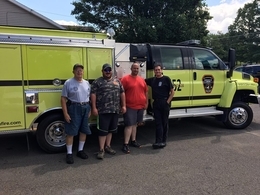 The Sandyston Volunteer Fire Department in New Jersey were in Laflin this afternoon accepting the pickup of the former Rescue 152, a KME/GMC Mini-Pumper/Rescue. Good luck, stay safe, it's served us well; but our ever expanding rescue capabilities have required us to look for something... "heavier"! Stay tuned! 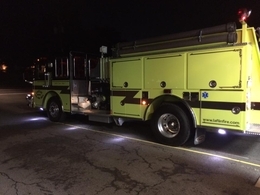 Laflin Fires "New" 2002 E-ONE Pumper is now in service. "New" Engine 152 responds to first "Job"
The Engine and Chief B were requested as 2nd due Special Service this morning to Meadow Run Road in Bear Creek Twp for a reported Structure fire. The crew of 6 operated as the RIT Team securing utilities and preforming the 360 before being sent interior to assist with overhaul and some hot spots. Units operated for approx 2.5 hours before returning. 3/17/17 - The Engine handled its second working fire of the day assisting Wilkes Barre Twp late last night for a well involved residential fire. Crews operated for approx 3 hours before returning. 3/17/17 - Laflin Fire was called to a working vehicle fire at the Oblates on 315. The engine and car handled with help of Jenkins Engine. 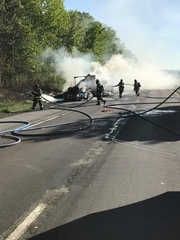 On an Early morning call for the Rescue and Chief, they were sent to Interstate 81 South in the borough for a 1 vehicle accident unknown injuries. While responding, units were advised of vehicle rollover with a patient ejected. R152 arrived first with a van in the ditch from the rollover with 4 total patients and 1 on the ground thrown from the vehicle. 3 station 152 EMT's responding with R1 took over patient care and assisted Regional Medic 29A with transport for ejected patient. All occupants transported to area trauma centers with Medic 2, Medic 29B and Commonwealth Ambulance. Engine 148 also assisted with patient care, provided scene lighting and traffic control. Fire Department members on 3/4/17 traveled to Lewistown Pa for their "new" 2002 E-ONE Typhoon Pumper. Unit will replace our 1992 Pierce Pumper. Unit is planned to be in full service by April 1st. Engine 152 was brought in on the 2nd alarm assignment to Pulaski Street in Wilkes Barre Twp for the working structure fire. E152 was tasked to work with members from Plains Twp and Hanover Twp on division 2 knocking large bulks of fire and opening up void spaces before the fire went defensive. Crews operated for approx 3 hours before returning. both Rescue 152 and Engine 148. Complete Door removals were done on both sides of the vehicle along with removals of part of the headrests and available sections of the roof. 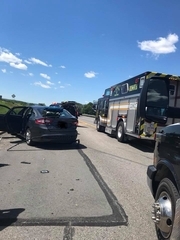 With the assistance of Jenkins Twp and Medic 2, the patient was removed from the vehicle and in EMS care in 14 minutes from the initial call to 911. 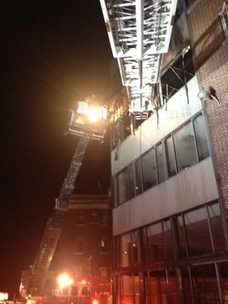 The patient is listed in critical condition at Geisinger Wyoming Valley Medical Center. Fantastic work by all involved for the quick, efficient and safe extrication from the gruesome crash. Shortly after 10am, the Structure assignment was struck for Main Street in Laflin for the reported dwelling fire. Chief A quickly followed by the Engine were first arriving reporting the smoke showing, and a fire on the first floor with 2 adolescent occupants just escaping. 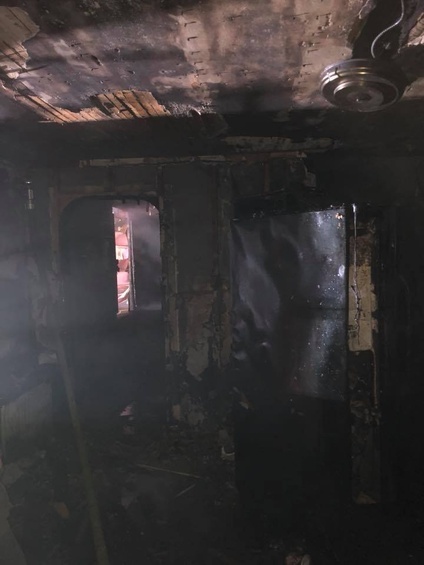 The first line went quickly into operation before mutual aid units were arriving quickly knocking the fire and containing it to the kitchen and living room. Engine 148 laid the supply line to Engines 152 and 128. The main body of fire was out in under 10 minutes. 3 animals were in the home at the time, 2 made it out and 1 was transported to Plains Animal Hospital by Medic 2 with a condition unknown. Solid work by companies 148 (Jenkins), 167 (Plains), 128 (Exeter), and 143 (Hughestown) assisting on the job. 12/18/16 Santa arrived in town with a parade of all the Laflin Fire vehicles and then enjoyed the party at Saint Maria Goretti Church. 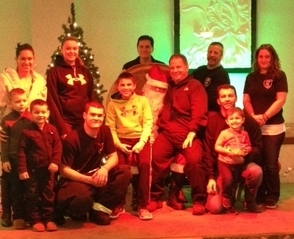 The Laflin Rec Board as always did a great job providing gifts, pizza and cookies for all. The 152 ATV is now in service! 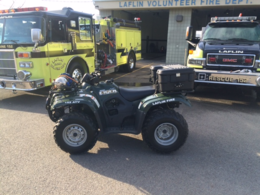 Thanks to a grant from the Geisinger Medical Center, Laflin Fire has put in service a All Terrain Vehicle. It is fully equipped with 2 way radio, lighting equipment and more. Members spend the afternoon training on Vehicle Rescue and Vehicle Fires. Members of Laflin, Jenkins Twp and Exeter Borough worked on vehicle stabilization, extrication and vehicle firefighting. Thanks to RM Recovery for the donation of vehicles for today's training exercise. The Engine and Chief along with the structure assignment were once again at 1 Passan Drive in the Borough for a reported machinery fire inside the building. 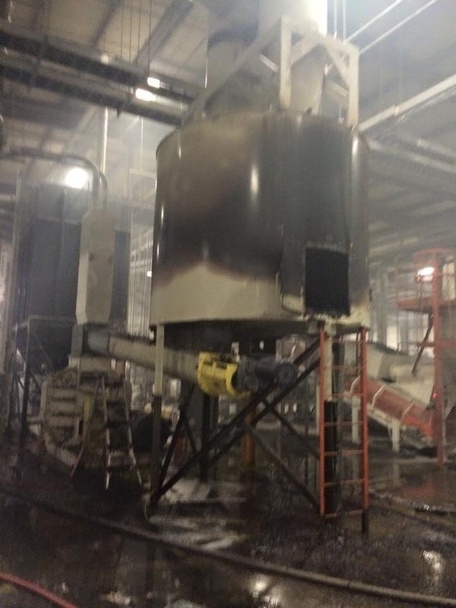 The engine was first arriving confirming a fire in the bailer with heavy overhaul needed. Hughestown and Jenkins companies assisted with the fire while Plains Twp handled the ventilation duties. Thanks to all companies that responded in to assist. Units cleared after approx 2 hours. and then click on the join tab and print an application! Congrats to Chief Jeff and his crew on winning best appearing utility at the Sept Brownsville Parade! Just after midnight the box was send to 1 Passan Drive in the Borough for a Commercial Fire Alarm at Bldg 2, Green Fiber. The Engine was first arriving with smoke showing upgrading it to a fire in the building. 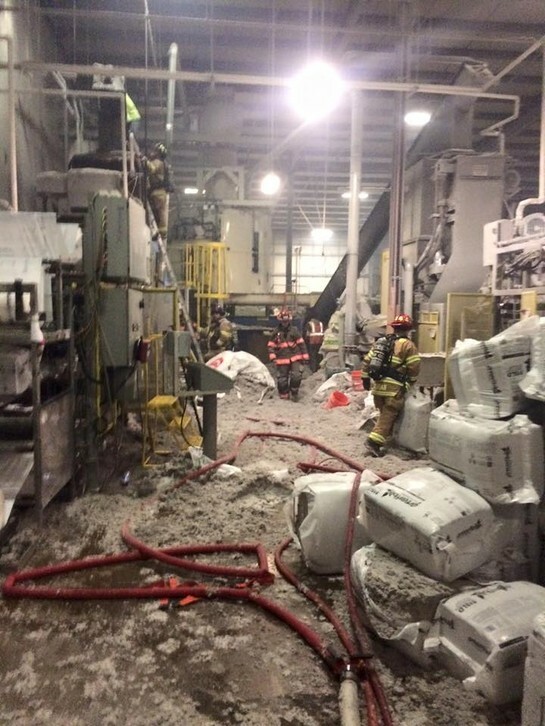 Units went to work on 3 machine fires in the building stretching lines and gaining access to areas of the machines. 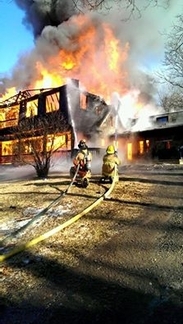 Chief 148/Capt 152 handled Interior Operations Command while Chief 143/Asst.Chief 152 handled IC and Accountability. Units operated for approx 90 minutes overhauling and ventilating the building before returning. Thanks to Jenkins Twp 148, Plains Twp Fire and Rescue 167, Hughestown 143 and Pittston Twp Fire 166 on the assist. 9/19/2015 Engine and Chief along with the first due assignment was alerted to 1 Passan Drive in Laflin for a reported commercial fire. 152 Engine was first arriving and stretching with smoke showing from side A. Engine 1 laid the bed of 1400' of 4" supply and the 3" setback line and went to work on 2 machines that had active fire. Engines 148 (Jenkins) and 143 (Hughestown) then went to work stretching lines and putting a knock on the fire. Plains Truck and Rescue assisted in ventilation and overhaul. The volunteers operated for approx 3 hours before returning to service. Thank you to all companies that assisted on the incident! The Laflin Fire Department has been notified by FEMA that our application to replace 4 15 year old air packs has been approved. The department will receive $23,528.00 and must provide a $1176.00 match This is the 2nd year in a row the department has received this grant, last year the LVFD was able to replace 10 sets of aging bunker gear. The Rescue, Engine and Chief were invited to the Pittston Area High School by its Stand Tall Club to assist in this years Mock Accident to raise awareness for drunk driving and making safe decisions on prom night. 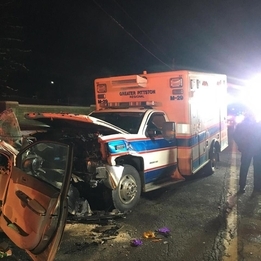 The Rescue along with Jenkins Twp Fire and Police, Pittston Twp Fire, EMS and Police and Pittston Regional Ambulance and Police worked to extricate victims and give students a real prospective during a serious vehicle accident. 5/13/15 The Engine and Chief were sent to Thompson Street in Jenkins for a working commercial fire. Due to hazardous chemicals burning in the facility, the Pittston Area High School was evacuated. Crews operated for approx 7 hours before being released. 4/11/15 - The Laflin Fire Department hosted a Structural Burn Session this week at Luzerne County Public Safety Training Facility. The class was lead by Chief Brian Mandak of the Hazleton Fire Department, with assistance by John Zagarski from the Nanticoke Fire Department, along with Chief Aulisio from Old Forge, also Paramedic Brian Bloom and Instructor Paul Klecha from the Kingston Fire Department. The department spent 16 hours this week learning tactics for structural fire fighting including multiple live fire drills on Saturday the 11th. The Engine Company was tasked with water supply fill site then 2 rekindles for a structure fire in Bear Creek. Engine filled 18 tankers over 4 hours then was re located to fire scene to assist in over haul. The Laflin Fire Department ended 2014 with it’s largest monthly call volume and largest yearly volume in it’s history. The department responded to 34 calls in December and 230 calls for 2014. 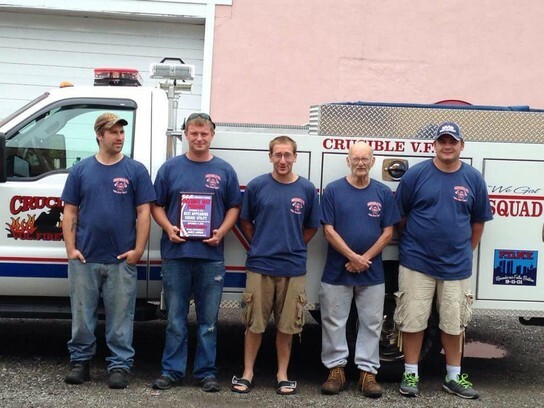 The Fire Department operates independently and almost solely relies on residents donations. The department appreciates the $7100.00 received from Laflin Borough annually. The borough also provides a EMT / Firefighter Monday thru Friday 8am to 4pm. This person also handles all the day to day maintenance of the borough . 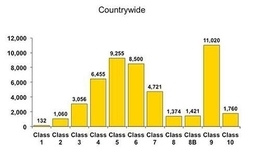 The borough allocation amount almost covers the departments yearly insurance payment. 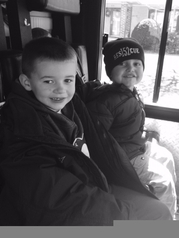 The departments Door to Door Fund Drive letter will go out late January, please be as generous as you can. The department has taken on yearly payments of $20,000.00 for it’s rescue / pumper and QRS unit. The Engine responded to its second working fire today to Divorce Court in the Heather Highlands Trailer Park for a confirmed working structure fire. The Engine arrived on the scene just behind the first due engine and dropped a supply line to Pittston City (165) Engine. 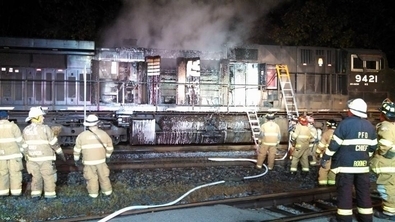 The Engine crew was again immediately sent to work assisting the interior crews in suppression and extensive overhaul. While on scene, the Rescue Squad and Car was sent to a MVA on Rt.315 in the Borough. No injuries were reported at the accident. Again, great job by all Jenkins Twp, Pittston City and Laflin Fire Department Crews on another good stop. The Engine returned to service after approx 3 hours. The Engine and Chief were sent to ACS Christian Manor Personal Care in Jenkins Township for a reported Commercial Structure Fire. 148 Truck was first arriving reporting heavy fire conditions on the 3rd division. 152 Engine crews immediately were sent to work, stretching a primary setback line and high rise pack to the third floor and assisted in knocking down the fire with Pittston City and Jenkins. The Engine also split crews and assisted in secondary search on the buildings 4 floors. The Engine and Chief remained on the scene assisting Jenkins with suppression, overhaul, and checking for hotspots for approx 3 hours. 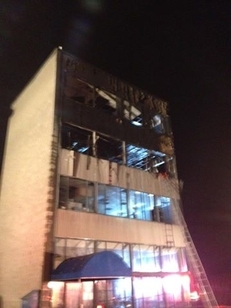 All 69 of the buildings residents were evacuated safely with only minor injuries reported. The 152 crew took part in a full day of training at soon to be demolished flood homes on River Rd Jenkins Twsp. Ladders , ventilation, hose line advancement, bail outs, roof work were some of the many topics covered. 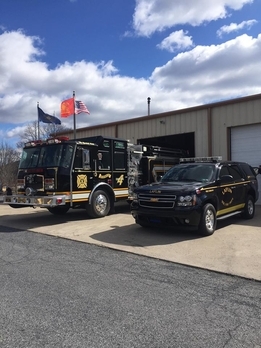 Squad 152 has relocated to the Crucible Fire Department in Crucible Pa. Crucible is near the West Virginia border about an hour south of Pittsburgh. Congratulations to Chief Jeff and his staff on their new vehicle. Laflin Fire placed in service a new 2013 Chevy Tahoe Fire Command / QRS unit. Unit is a 2013 police package Chevy Tahoe customized by Fast Lane Emergency Vehicles in Purcellville Va. 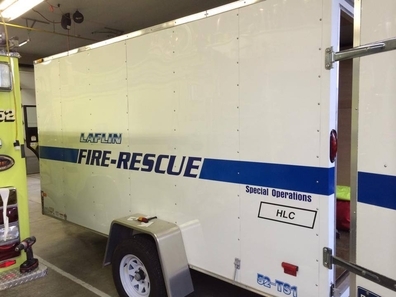 Along with the Command Vehicle, the department also received the Special Operations Trailer. This will carry all necessary equipment for special incidents such as Haz Mat incidents and Pumping Details. Stop by and take a look! 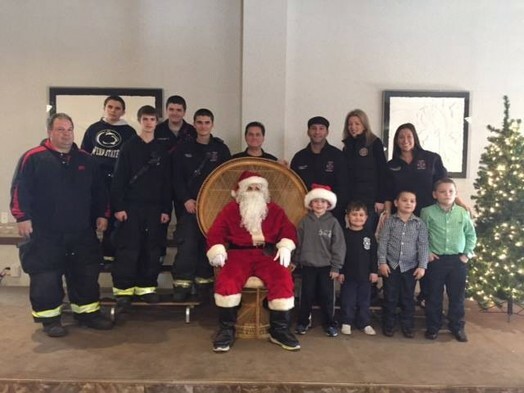 The members of the Laflin Volunteer Fire Department picked up Santa at the North Pole, took Santa around the Borough on Engine 1 and then to Saint Maria Goretti Church where Santa visited with all the good boys and girls of Laflin . — with Markie Malvizzi, Drew Malvizzi, Marc Malvizzi, Bill Kennedy, Suzanne Dudeck Kennedy and Richard Lewis. Laflin Fire ISO rating soars to a 5 ! The results are in! The Laflin Volunteer Fire Department has soared to a 5 rating from ISO, a fire department rating agency that provides ratings to insurance companies in setting fire insurance rates. There are 2864 fire departments rated in Pennsylvania, the highest percentage are 737 departments with a rating of 9. 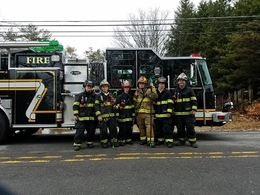 To put this in perspective of how difficult it is to achieve the highest score of 1, Plains Township was just issued a 4 after many upgrades to their training and equipment and the addition of their new ladder truck, putting them with other cities like Bethlehem, Kingston, Scranton and Erie. Wilkes Barre has the highest local rating at 3, joining just 25 others in Pa with a 3. All of these departments have a 24/7 paid staff. Only 1 Pa department has a 1, and 2 Pa Departments have a 2 rating. 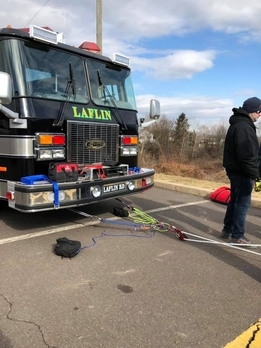 Laflin Fire Chief Marc Malvizzi said: “This is a testament to the hard work of the Laflin Volunteers who strive for excellence with training, equipment and safety. With over 2000 hours of training in the last two years alone, most Pro Board Certified FF1, FF2, and Haz Mat courses, and equipment upgrades of a new QRS/Brush unit in 2011, and a Rescue Pumper in 2012, the LVFD stands ready to serve Laflin and surrounding communities with the best in fire protection”. 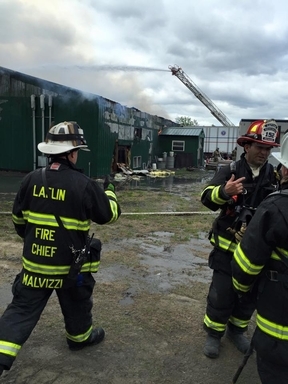 The Engine, Rescue Squad and Fire Command were struck along with all first alarm companies to 1 Passan Drive in Laflin at Valley Distribution for a reported Working Commercial Structure Fire. Plains Twp Truck, Pittston Tw...p Rescue and Laflin Engine were the first arriving compaines with a 1 story commercial with fire showing from a Tractor Trailer near the structure with fire traveling up the wall. Units quickly went to work stretching an 1 3/4" attack line to get a knock on the fire while the 152 Engine crews along with 166 and 112 went interior to check for extension. 167T1 went to the roof while the interior crews worked on venting the warehouse. Units operated for approx 2 hours before releasing the first alarm companies. 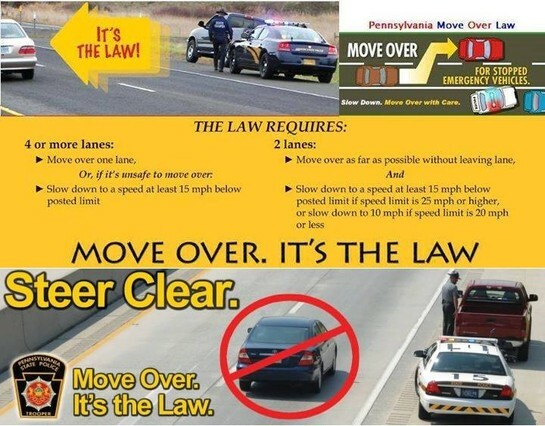 Special thanks to Pittston Township, Avoca, and Plains Township for the assistance. 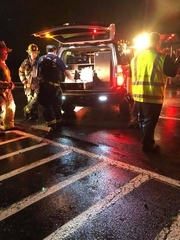 "Late Night Pin Job in the Borough"
Laflin Rescue 1, Engine 1, Squad and Fire Command responded to the area of Laflin Road and Main Street for an MVA with Injuries. While responding units would be advised of confirmed Entrapment. Rescue 1 was first arriving to find 1 vehicle into a tree with 1 patient entraped. Rescue 1 quickly stabilized the vehicle and put the Amkus Cutters and Spreaders into service to begin extrication. Rescue 1 would have the patient extricated and into the care of EMS in approx 5 minutes. Units operated for approx 2 hours before returning to service. Laflin Chief and Squad responded to Rt.315/Laflin Road in the Boro for a 1 Vehicle MVA, Vehicle over an embankment. Squad Co. arrived to find 1 vehicle over an embankment with no patient found. Squad assisted RM Recovery with the Tow along with Traffic Control. Squad cleared after approx 2 hours.